In the name of God, what’s happening? I mean the title of this blog both literally and metaphorically. This is the time of year when Delhi (where I live) witnesses the deeply disturbing spectacle of thousands of Hindu pilgrims marching through the city as part of the annual Kanwar Yatra. “The Kanwar Yatra is an annual pilgrimage taken by the followers of Lord Shiva known as Kanwariyas. The devotees go on a pilgrimage to places of religious significance like Haridwar, Gaumukh and Gangotri in Uttarakhand to fetch holy waters of the Ganga river. Millions of such Kanwariyas participate in the yatra and collect water from the holy river and carry it across hundreds of kilometres on foot. They later offer the water at their local Shiva temples or specific shrines like Pura Mahadeva and Augharnath temple in Meerut or the ancient Kashi Vishwanath temple in Varanasi. 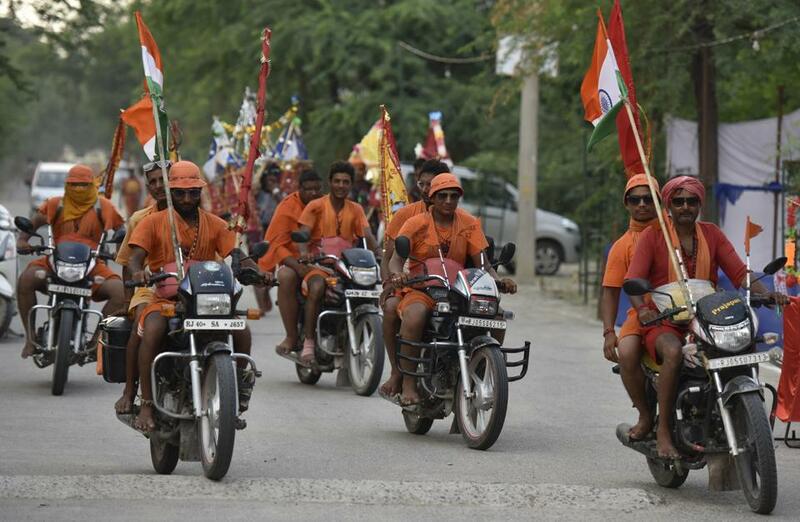 The yatra takes place in the Hindu calendar month of Shravan. A couple of nights ago, sitting inside the house, windows closed, A/C on, curtains drawn, front door shut, room door shut, we were assailed by noise and vibrations so loud that the house and the air literally trembled. A truck carrying these so-called religious “pilgrims” was driving uber-slowly down our street, Bollywood music blaring, as the men sat on the roof of the truck, motorbikes accompanying them, flags fluttering, horns blaring. Yesterday I had to go to Gurgaon for a plogging drive, and the highway was a disaster. Traffic crawling along, blocked by tractors and trucks carrying these “pilgrims”. There were “pilgrims” walking on the highway, where pedestrians are not allowed. There were “pilgrims” sitting on the highway. There were “pilgrims” with bats. There were national flags on just about every vehicle and every religious offering. I’m sharing below 2 quick videos I shot out of the car window, while Ripu negotiated the terrible traffic. You might ask why the flag on a religious procession? Well, let’s just say that the linking of Hinduism and “nationalism” is becoming increasingly prevalent. It almost implies that these men, these violent, rowdy, bat-wielding men are patriotic. And as for the bat – well, you’ll learn more about that in a moment. Call me a naive old fool, but in my book nationalism and violence have NO part in ANY religion. End of story. But year after year, these so-called religious men swagger through the streets of Delhi, bringing the traffic to a halt, forcing schools along the way to close, being fed and watered free, wasting police resources…all in the name of God. Walking on the road last night in Moti Nagar in Delhi, walking please note – on the road, in the traffic – some men claimed that a car brushed against them. They were on the road, remember. Walking amidst the traffic. The internet is on fire with criticism of the police who, it is claimed, did nothing. I have no idea whether they intervened or not. But what I do know, however, is this, a propos the police taking action: the police have moved along the fruit vendors who used to ply in our street. The nice man whose fruit stall was outside our house, who stored his stuff overnight against our wall, and who had a rubbish bag attached to his cart to keep the place clean…moved along by the police. No idea whether the police confiscated his goods and his cart, poor man. I’m just sharing that story, as a counterpoint, to round off this story of the violent “religious”, flag-carrying men who trash our streets with impunity, block the traffic, smash cars. And finally, here’s a link to a blog post I wrote last year, on this self-same subject, with an amazing range of comments. 1 comment to In the name of God, what’s happening? Ur description is so apt..nd all this is disturbing indeed.